Norfork Lake fishing is in its summer pattern and fishing methods should be very similar for the next month. 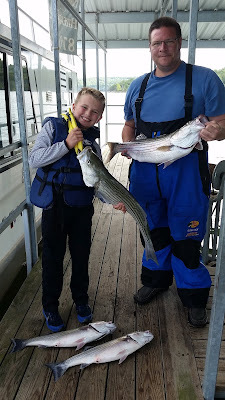 The striped bass bite continues to be good for most out on the lake. 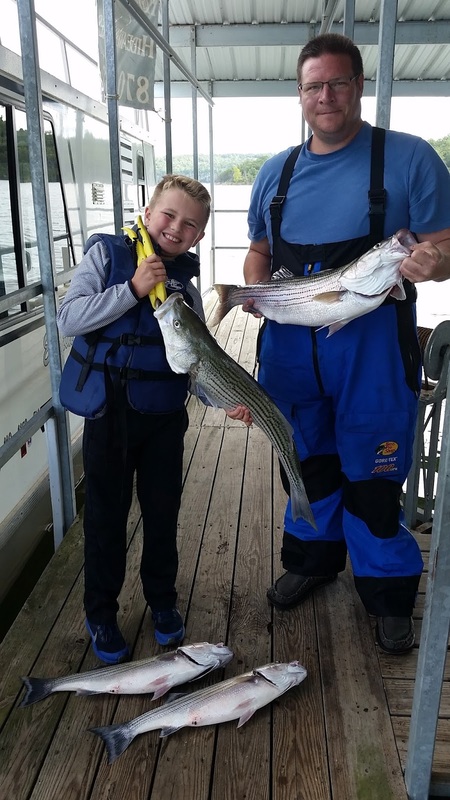 The easiest and most productive method of catching stripers at this time is with live bait. Live threadfin shad, shiners and small bluegills are all working well, with shad being the best type of live bait. 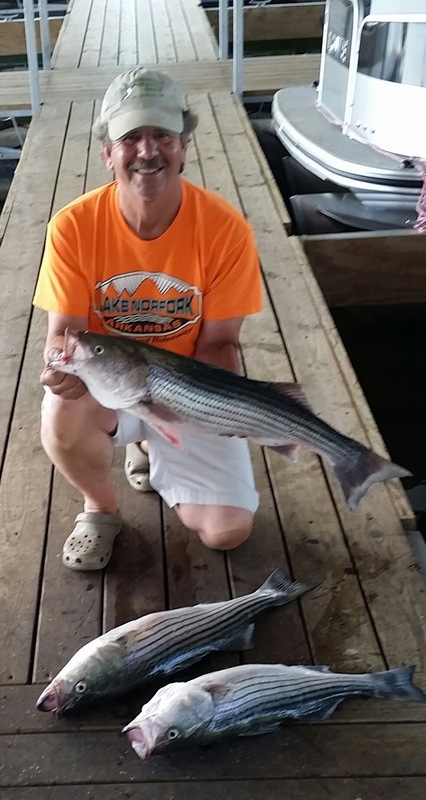 I am currently finding large schools of stripers lying on the bottom in 70 feet of water. 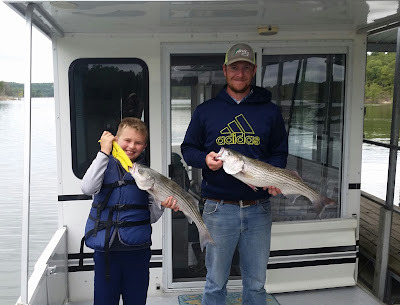 The best areas to find the stripers at this time are on points and large deep flats in the dam area and at the start of the Big Creek area (Long Point, Koso, Thumb, Point 1, Hudson) and also on the flats out in front of Sand Island in the Jordan area. Artificial baits are also producing striped bass. Try vertical jigging with a spoon or a 3 inch (or so) grub with a 1/4 or 3/8 ounce jig head. If you're jigging keep the action of your bait moving slow, use small twitches of the bait and work them slowly on the bottom. It is hard to feel the bite so be ready to set the hook with the slightest heaviness of your line while moving the bait. 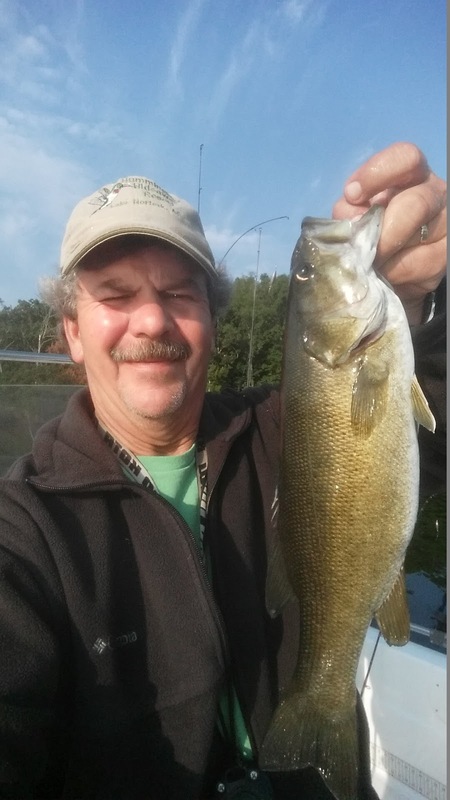 Trolling swimbaits and 4 - 5 inch crank baits are also producing some fish. A second area to catch hybrid bass and on occasion striped bass is in 25 feet (+ or - 5 feet) of water. The lake thermocline is roughly at 25 feet with good oxygenated water from the shore line out to 25 feet with about 80 - 84 degree water temperature though out this water column. Most of the bait fish that I have found is in this 0 - 25 feet range so as you would guess it is holding lots of fish. I have found some schooling hybrids in the mid lake area in the 25 feet range feeding on shad. With this shallower water all types of artificial baits will work. 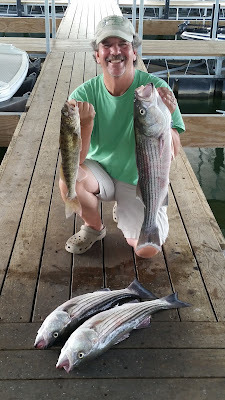 I had a friend trolling deep diving crank baits and ran into schools of nice striped bass on points in the mid lake area. The walleye bite is getting good. Most walleye are being caught in 18 - 25 feet of water on the bottom. Trolling a crawler harness with bottom bouncing weights are catching some nice fish as are deep diving crank baits such as a Flicker Shad. If you're using crank baits use about a 4 inch minnow imitating crank. If you just have shallow diving cranks you can always add some inline weight to get your bait down to the 20 feet level. I have always had the best luck when the bill of the crank digs into the bottom of the lake a little. Walleye are showing up all over the main lake including points and large flats. I have used thread fin shad set on the bottom and have picked up a few walleye. I have also caught walleye while I am striper fishing in 70 feet of water. Yesterday I did not land any walleye, but on 4 different occasions I set my hook on a light bite to bring up only my weight and leader with no hook. I would guess that I was getting numerous walleye bites. Pan fish are also in the 0 - 25 feet of water range. If you can find some brush pile in 20 - 25 of water you will find some crappie, but most are roaming the flooded shoreline trees feeding on shad. Crickets are working well for blue gills in the shallow water. Catfish are showing up at all depths. 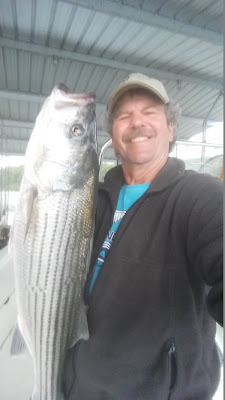 I have caught cats in 70 feet of water when striper fishing, as well as in 20 feet of water while walleye fishing. They are roaming all over the lake. A week ago I had a family that love to bow fish. I sent them over to a point in the Cranfield area and they had a blast. The best part of this group is that they clean and eat what they shoot. 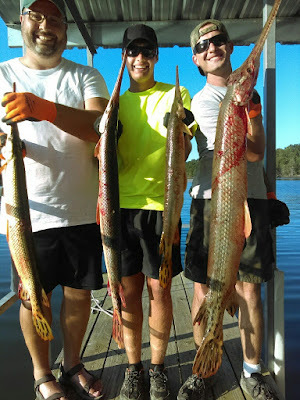 I have never eaten gar before, but they tell me they are excellent eating as long as they are cleaned properly. 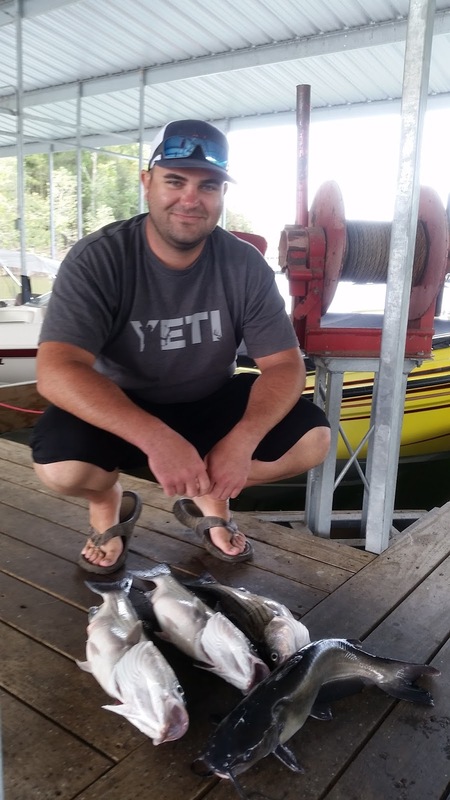 I took a cleaning lesson one afternoon when they were cleaning their catch and saw that you end up getting a nice white fillet with no bones after you are done. I guess I will have to try cleaning one next time I land a gar. I typically cut the line and release them when I do catch one. The Norfork Lake level is falling slowly and currently sits at 566.3, which is about 11 feet above normal pool. The surface water temperature is ranging from 82 - 85 degrees depending the time of day. The main lake looks fairly clear with the creeks and coves stained. Our regular road down to our dock is finally clear of water and totally usable and our boat ramp is usable for launching of boats and PWC. We have a good portion of our parking lot available again so it is really easy to walk onto our dock. This is a great time of year to visit Norfork Lake as it is not very crowded and the lake is in great shape for all you lake lovers. The water is warm and all your favorite water sports are ready and waiting for you - swimming, skiing, tubing, fishing, ect. Come down and fish a little and play in the water a little. You will have a fantastic time. Hummingbird Hideaway Resort has cabins available for your Norfork Lake vacation. When you check in I'll be happy to point out my current favorite fishing spots. I can also help you find a guide if you would like a guided trip.